BUFFALO, N.Y. -- University at Buffalo freshman running back Jaret Patterson and senior defensive tackle Justin Brandon were awarded with Mid-American Conference East Division Offensive and Defensive Player of the Week honors, respectively, on Monday, the league announced. It marks the first time in their careers Patterson and Brandon have been recognized for the award. Patterson had a groundbreaking night, rushing for a career-best 187 yards and two touchdowns in Buffalo's 48-14 win over Kent State on Tuesday night. The true freshman set the tone early by ripping off a 64-yard touchdown run on the second play from scrimmage to quickly give the Bulls a 7-0. He added a 21-yard touchdown run later in the game. His 187 yards on the ground was the highest single-game rushing total by a freshman in school history as Patterson carried the ball a total of 18 times for a 10.4 yards per carry average. Brandon, one of 20 seniors the Bulls honored before the game against Kent State, had three total tackles and pair of sacks for the Bulls. He helped spearhead a defensive effort that held the Flashes to just 39 total yards in the first half. It was Brandon's first career multi-sack performance and just the third time in his career he recorded at least 1.5 tackles for loss in a contest. It is the 10th time this season a UB player has won MAC Player of the Week honors. Buffalo's junior signal caller, Tyree Jackson, has collected offensive player of the week honors on three different occasions this season, including each of the first two weeks of the campaign. Cornerback Cameron Lewis was named defensive player of the week after his two-interception performance against Temple. Wide Receiver K.J. Osborn was honored after his 188-yard, three-touchdown performance against Eastern Michigan. Linebacker Khalil Hodge has won the award three times on the year. 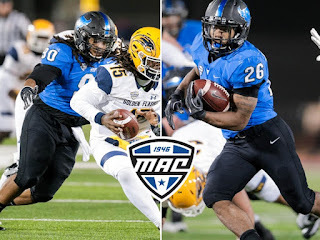 Additionally, it is the second time this season Buffalo has swept MAC East Division Offensive and Defensive Player of the Week honors joining Jackson and Lewis' standout performances in Buffalo's 36-29 victory at Temple in the second week of the season. The Bulls will head to Athens, OH for a showdown with the Ohio Bobcats (6-4, 4-2 MAC) on Wednesday night. Kickoff is slated for 7:00 pm.